Graham Wootton, an active member of the Sydney University Bushwalkers in the 1960s and early ‘70s, recently scanned some of his amazing Kodachrome slides from club trips. While a handful look extremely dated, it’s amazing how many of the scenes appear almost identical to modern day adventures. Along with the photos, Graham has shared some recollections of his introduction to canyoning in the Blue Mountains, along with some insights into the incredibly basic gear and techniques. Unfortunately there aren’t too many canyon photos (Kodachrome II was only ISO 25, the only waterproof camera available was the expensive Nikonos, and with only woollen jumpers for warmth most people were too focussed on fighting off hypothermia to want to hang around for photos), but what he did capture were some amazing moments in time. Start of the tunnel swim, Thunder Canyon, November 1968. With no wet suits in those days a lilo made the tunnel swim a lot more bearable. As a teenager growing up in the Blue Mountains in the early sixties, exploring the exciting new world of canyons was a natural and integral part of being a bushwalker. These were the early days of canyoning, not the very beginnings, but a time when only a dozen or so canyons had been found and certainly well before canyoning had become a sport in its own right. 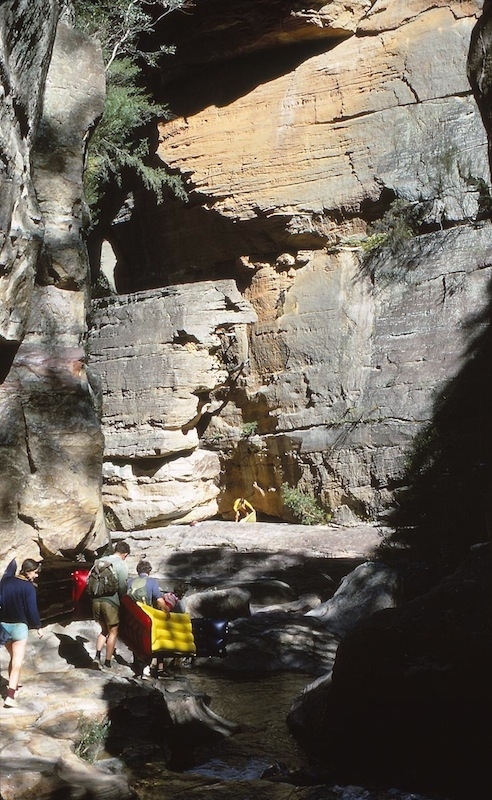 After learning the basics of abseiling with the Scouts in Glenbrook Gorge, my first real canyon trip was Arethusa Canyon with the Sydney University Bushwalkers in February 1963. One of the first discovered and descended canyons, Arethusa is not difficult but is still eminently interesting and worthwhile, with the amphitheatre that opens up below Arethusa Falls one of the finest vistas in the whole of the Blue Mountains. SUBW party, November 1968. No wet suits or helmets in those days! Possibly the most lingering memory of that trip was of a girl in the party who was so exhausted that every time we stopped for a rest she immediately went to sleep. This was her introduction to canyoning, courtesy of one of the club’s male stalwarts. I don’t think the budding relationship survived the trip! My next canyon experience was near Kanangra Walls, on a trip led by Coast and Mountain Walkers legend Colin Watson. The aim of the trip was to install an anchor bolt at the top of the second falls in Davies Canyon. It poured with rain all Saturday, so we sheltered in Budthingeroo Hut and only ventured down the canyon on Sunday. Kameruka Bushwalking Club trip, Wollangambe Canyon, October 1970. This was my first experience of the grand scale of the canyons coming off the Boyd Plateau. The torrent of water at the base of the first waterfall was truly reminiscent of a storm at sea. We reached the top of the second waterfall, however the person responsible for bringing the piton hammer had forgot to pack it. We soon realised that trying to drive a rather blunt star drill into hard metamorphic rock using an axe borrowed from the hut was a futile exercise and made a good excuse for a return trip. One of the pioneers of canyoning in the Blue Mountains recommends that to really experience what canyoning is all about you should go in a party where no-one has been down the canyon before. Only then will you get the full appreciation of the exploration experience. My third canyon trip, Mt Hay Canyon, fell into this category, with a mate from Sydney University and myself setting off from Leura early one Saturday morning in 1964. A peaceful Sunday afternoon floating down the Wollangambe. Mt Hay canyon is a short but technically more difficult canyon, with an awe inspiring main section and an abseil from a chockstone that descends out of sight into the unknown. Of all my early canyon experiences, Mt Hay Canyon shines clearest and brightest in my memory. By mid 1964, the Carmarthen Canyons near Mt Tomah — Thunder, Ranon and Claustral — had become the Mecca for canyoning bushwalkers. I did a number of trips down these canyons over the next years until I moved to Tasmania in 1971. Approaching Exit Rock, Wollangambe Canyon. Looking back over those trips I am horrified by some of the experiences we managed to scrape through. On one trip, a member of the party, who was new to canyoning, developed such bad cramps in his legs at the top of the final abseil in Claustral that he went as straight and rigid as a log. Fortunately his arms still worked, so we lowered him like an inanimate object over the lip of the final abseil, with someone stationed at the bottom to unhook him and help him across the pool to the Ranon junction. Oh for a wetsuit then! Rick Streatfield, Athol Abrahams, Wendy Butler and Phill Isaacs on Mt Owen, Budawangs, October 1966. The only concession to the problem of the freezing water was usually a woollen singlet or jumper worn next to the skin. Proper dry-bags did not exist and pack waterproofing was mainly achieved using garbage-type bags, usually two or three at a time “just to make sure”. As for ropes, most of my abseiling practice and early canyoning was done using manilla ropes. Hawser-laid nylon ropes, at $15 for a 150 foot length, were somewhat of a luxury. I remember well being presented with one by the Sydney University Bushwalkers as a 21st birthday present. SUBW annual reunion at Blue Gum Forest, February 1968. Abseiling techniques were also quite different. Most bushwalkers used the “over-the-shoulder” method. This comprised a simple sling around the top of the thighs, clipped together with a carabiner, through which the rope from the anchor passed. The rope then went over the shoulder and behind the back, held and controlled by the hand on the opposite side. 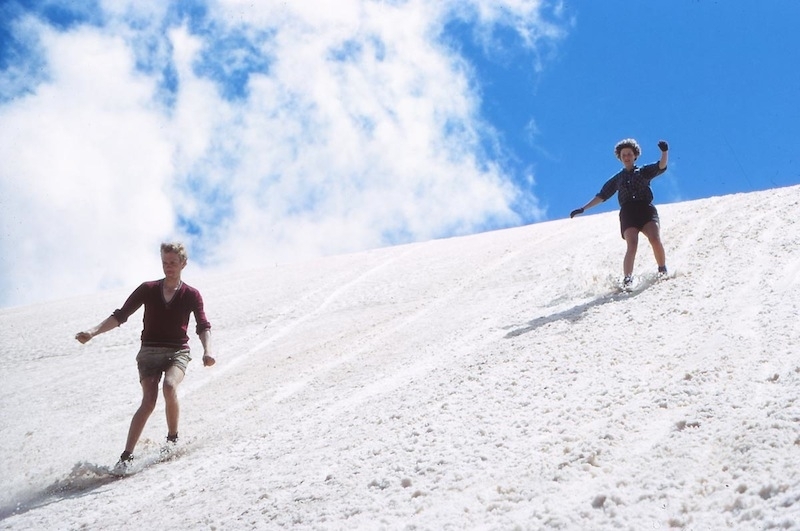 It created a lot of friction and heat on the shoulder, so some bushwalkers sewed leather patches on their shirts or even made special leather shirts to overcome this. It almost became a badge-of-honour, and proof that you were a seasoned canyoner, if you had twin rope burn scars on top of your shoulder. Athol Abrahams and Wendy Butler on the first ascent of the west face of the Castle, Budawangs, Easter 1966. Other canyon experiences from those days include Danae Brook and Wollangambe Creek. Danae Brook, at Kanangra, is a predominantly vertical canyon with multiple abseils between huge rock walls, including the famous double-rope waterfall abseil. Although Kanangra canyons are generally more open and drier than the sandstone canyons, this is one spot where you get very wet indeed. 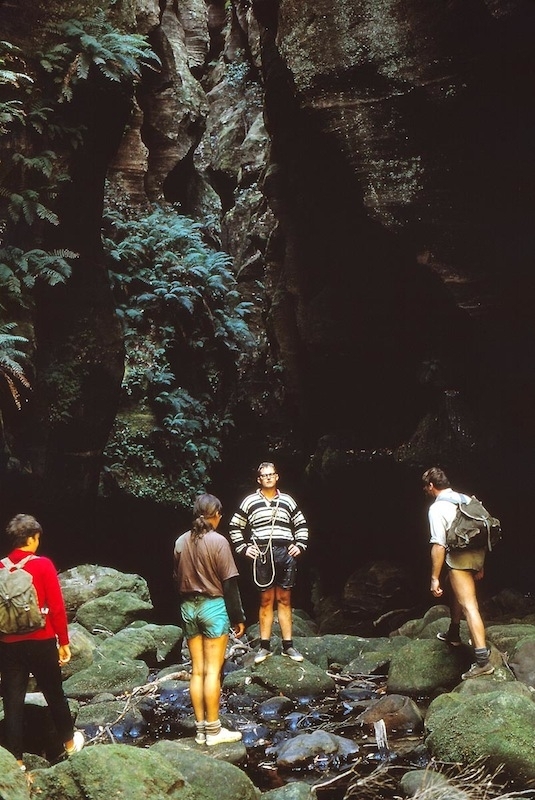 In those days, Danae Brook was one part of a trifecta of great bushwalking trips that inspired a generation of Sydney bushwalkers, the other two being the Three Peaks and traversing the Western Arthur Range in Tasmania. The morning after, SUBW recovery walk, November 1969. Wollangambe Creek, near Mt Wilson, was at the other end of the spectrum. This horizontal canyon has no abseils or significant climb-downs. Instead, it features kilometres of long tranquil pools between steep sandstone walls, ideal for paddling down on a lilo. On a warm afternoon, they are bliss. Wollangambe Creek was one of the last trips I did in the Blue Mountains before I moved to Hobart in 1971. Lynsey Welsh, SUBW’s first female president, liloing in Glenbrook Gorge, January 1971. 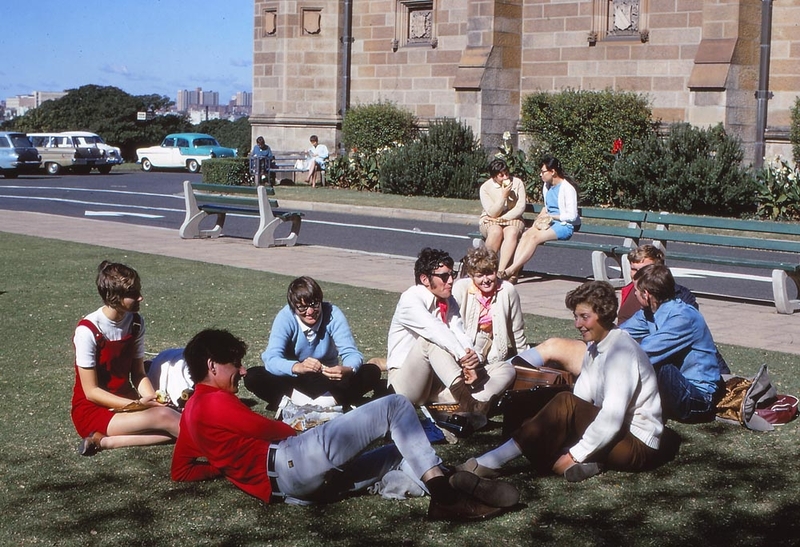 SUBW Wednesday lunchtime meeting on the Botany Lawn, 1970. SUBW mud fight at Lake Louise, Shoalhaven River, January 1969. Names withheld to protect reputations! SUBW party on Luckmans Lead en route to Federation Peak February 1967. Camp at Lake Roseanne, Western Arthur Range, February 1967. SUBW annual cooking competition at Sharks Head Cave, Glenbrook Creek, July 1968. The winning entry, a steamed pudding with golden syrup and dates. Some members made their own gear in those days (David Moore). Jim Box and Hugh Powell cutting out a tent site on Watsons Crags ridge, October LWE 1968. Note the use of garden spades and all that snow in October! Camp on Watsons Crags ridge with Mt Twynam in the background, October 1968. Note the Paddy Pallin walled japara tents and sticks for tent poles. Athol Abrahams, John Lucas and Jim Box on the Tonalli Range traverse, August 1965. Carol Isaacs and Jim Box on the Castle, looking towards Currockbilly, June 1968. En route to the Sentinel, Snowy Mountains, January 1969. Group glissading on the Grey Mare Range, January 1969. Volleys skiing on Mt Anderson, January 1969. Following the heavy winter snowfalls of 1968, big snow drifts persisted on the Main Range well into summer. Camp at Moiras Flat, Hannels Spur, January 1969.